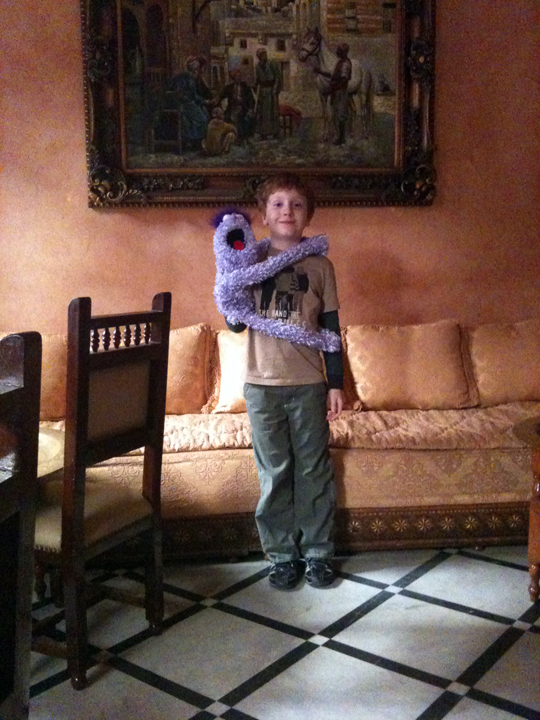 Here's Purple Puppet (yup, that's his name) on day 1 of our 28 day trip to Morocco. We are waiting for the subway to our hometown airport. Look at him. Exhausted already. After a good night's sleep, and a little breakfast in Casablanca, he's feeling much better. His favourite parts of travelling with Spud? Keeping him company on trains, planes and buses. Sometimes he even got to go out and see the sites. But most of the time he was found keeping guard of our luggage. And he never complained. Well. Almost never. Sometimes he just had a little freakout. You would expect no less from such a wildly furry, purple creature, really. this is adorable. Your son must love this post. If he doesn't now, he definitely will later in life. I wish my parents had been this cool. 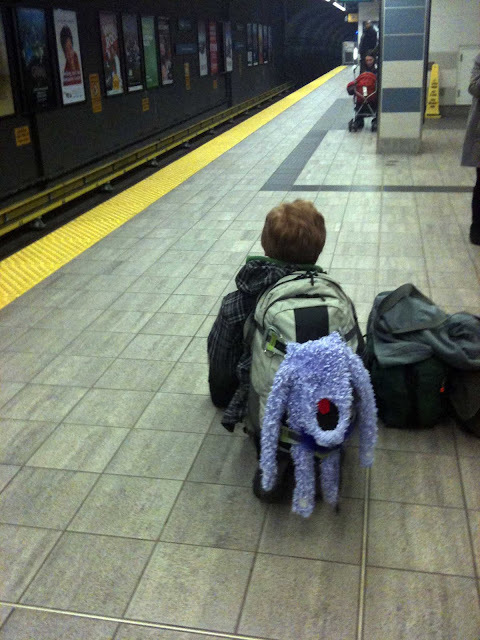 I love the back story on how Purple Puppet protects your luggage too. But gets to freak out on occasion. 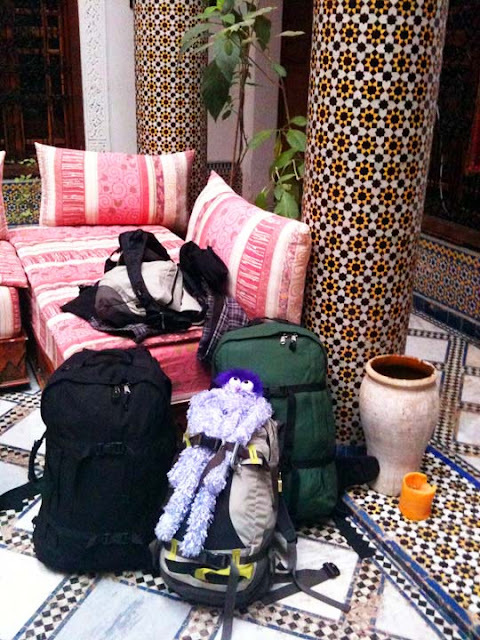 Kind of feels like my life some days ;-) I have loved reading about your adventures in Morocco. Thank you so much for sharing! Poor Purple puppet looks pooped in some of these images, but I love how the Purple One perks right up when it's time for his close up! The Travelocity gnome has nothin' on this guy! This is so cute!! I showed it to my kids and they wanted more!! This is so cute. 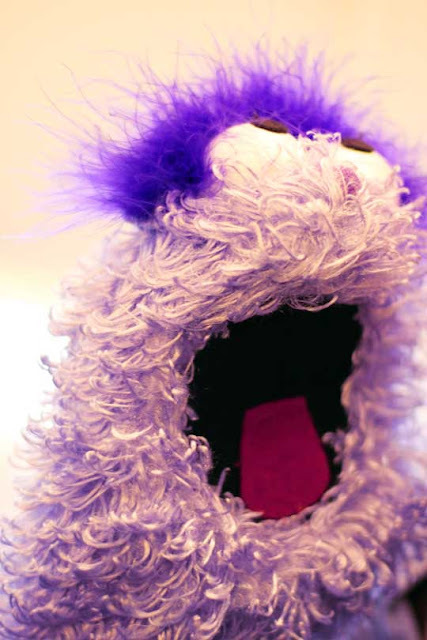 That puppet is so expressive! I bet that made your son alot of friends.